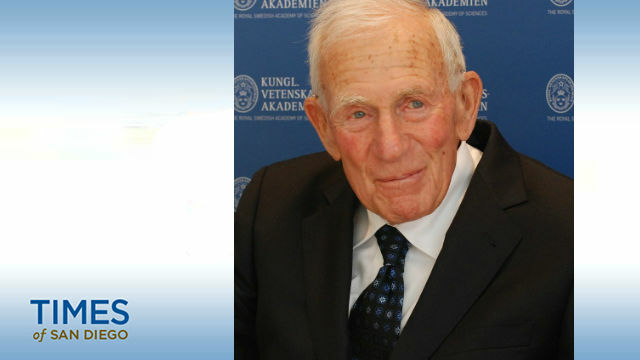 The City Council voted unanimously Tuesday to use San Diego’s new honorary street naming program to recognize renowned oceanographer Walter Munk, who helped found UC San Diego and made forecasts that assisted allied troops during World War II. Munk’s name will go on signs in the 8100 block of La Vereda Street in La Jolla Shores, along the boardwalk near where he performed experiments after becoming a professor at the Scripps Institution of Oceanography in the 1940s. Councilwoman Barbara Bry, who said Munk is often referred to as “The Einstein of the Oceans,” plans to unveil new street signs in October to commemorate his 100th birthday. He’s lived in La Jolla for 78 years, she said. “Walter is a physical oceanographer and geophysicist whose career spanning eight decades includes contributions to our understanding of ocean currents, tides and deep-ocean mixing, wind waves, tsunamis and seismic waves, and rotation of the earth,” Bry said. Bry said Munk, at age 99, studies climate change, with an emphasis on sea-level rise and its impact on poverty. The City Council recently used the honorary street naming program to honor “Star Wars” actor Mark Hamill, whose signs are scheduled to be unveiled on Sunday.